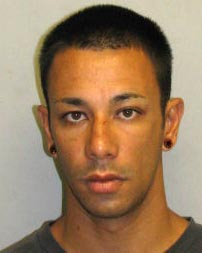 Hawaiʻi Island police have charged a 30-year-old Hilo man with burglary and other related crimes in connection with a break-in Wednesday (July 10) that was captured on tape in the Kaūmana area of Hilo. A surveillance video caught a suspect breaking into the house on South Wilder Road several times during a four-hour period. Items removed from the home included fishing gear, car parts, power tools and other items valued in excess of $1,700. On Thursday morning (July 11), police arrested Justin Fergerstrom and held him at the Hilo police cellblock while they continued the investigation. Friday afternoon, Fergerstrom was charged with three counts of first-degree burglary and one count of unauthorized entry of a motor vehicle. His bail was set at $85,000. He remains at the cellblock pending his initial court appearance scheduled for Monday (July 15).